With her police detective boyfriend working the case and a witch’s brew of suspects–including some bell-ringing Santas–Lee chases down leads aided and abetted by her wise cat O’Ryan and some unsettling psychic visions of her own. When a revealing clue leads to another dead body, not even a monster blizzard can stop Lee from inching closer to the truth . . . and a scoop that could spell her own demise this killer Christmas. Bells, Spells, and Murders by Carol J. Perry is another grand adventure full of mayhem. Murder, secrets, and danger lie here. It’s up to Lee Barrett once more to solve another murder investigation. She has a fiery personality that is fun to follow. Her curiosity and determination to solve a case is crazy sometimes dangerous. She is always finding herself in a difficult position. But in the end there is her boyfriend, Detective Pete, there to come to her rescue. It was funny, sweet, and engaging. I could not stop reading this novel. The mystery was good. So many possible suspects that I was guessing the whole way…I liked the red herrings that the main character dropped for readers like me. It was enjoyable. I am hooked. 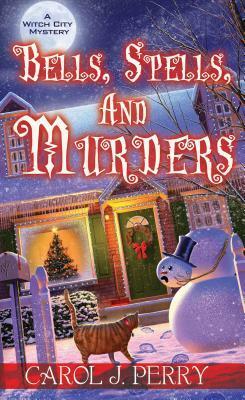 Bells, Spells, and Murders is highly recommended for all cozy mystery lovers. For fans of Angie Fox this is a must read. I loved the main character’s visions and the presence of cats running around…plus, there’s a bit of romance inside, too.